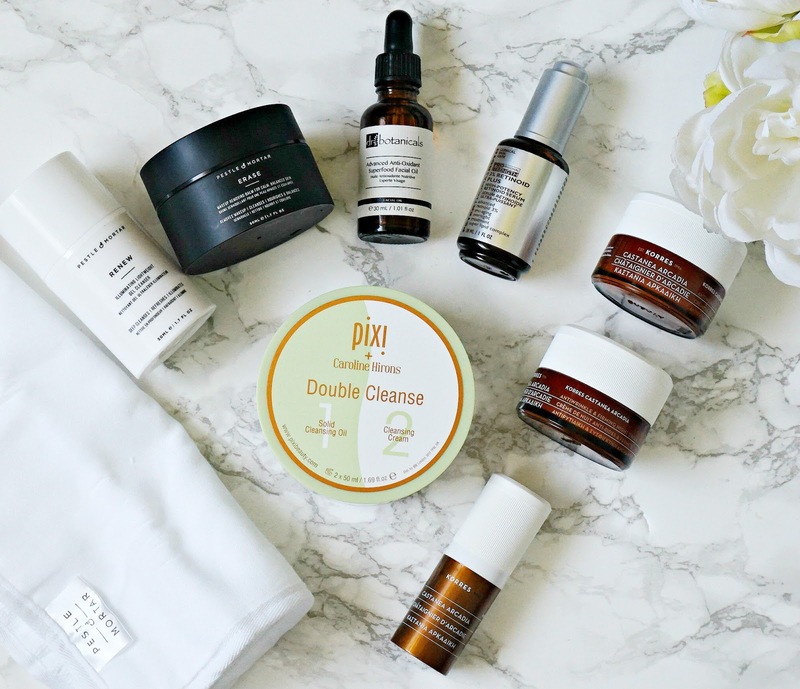 Recent additions to my skincare routine that I have been loving featuring Pixi, Pestle & Mortar, Peter Thomas Roth & more! Over the last 6-8 weeks, I have added some really fantastic products to my skincare collection and I want to share my thoughts on them with you today. You know that skincare is my "thing" and although I am committed to finishing lots of almost empty products (see my empties posts here), I couldn't resist adding some new products to my collection! First up is the Pixi + Caroline Hirons Double Cleanse, which was released in January. I didn't allow myself to buy it immediately because I wanted to use a few cleansers up first. This product contains two cleansers in one pot - a solid cleansing oil on one side and a cleansing cream on the other. There is a divider in between so there isn't really any chance of them blending into one. The pot isn't particularly travel friendly as it's quite big and bulky but I don't travel very much so it doesn't particularly bother me. The cleansers are fragrance free and at first glance seem very plain/basic but don't let that deter you. The solid cleansing oil literally melts away all traces of makeup and the texture is so easy to work with because it transforms to an oil so quickly, yet it doesn't leave an oily residue on the face. The cleansing cream is light in texture and a pleasure to use as a second cleanse or morning cleanse. The combination of both leaves my skin soft, clean but not stripped and clear. I am a huge fan of this cleansing duo and can see myself repurchasing it time and time again. I hope in the future that they either release a jumbo sized tube or else the two products individually. The second product that I bought is very similar to the Pixi Double Cleanse but it's a lot more expensive for the same quantity of product (50ml of each cleanser). It is Pestle & Mortar Erase and Renew The Double Cleansing System, which works in the same way - a cleansing balm to erase and a gel cleanser to renew the skin. What I really like about this duo is that they can be bought separately and the set also contains a double sided cleansing cloth (similar to Emma Hardie's if you are familiar with those). The balm has a slightly gritty texture, which I am not crazy about but that being said, it isn't harsh on the skin and does leave my skin very clean and nourished but not stripped. Although balm cleansers are my favourite way to cleanse, this balm won't be repurchased because I just don't like the texture. The Renew Cleansing Gel, however, is a big hit! If you have tried Oskia Renaissance Cleansing Gel and liked it then you need to try this cleansing gel because it is even better. It is lighter and more pliable in texture than the Oskia offering, which I love and is just as brightening due to the fruit enzymes it contains. I absolutely love how bright and radiant my skin is when I use this cleansing gel and I can see myself repurchasing this when I finish it. Peter Thomas Roth Professional 3% Retinoid Plus - my lovely sister in law picked this up in Sephora for me in February because I haven't seen it sold on any U.K. sites that sell Peter Thomas Roth products. I probably didn't need this because I have Pestle & Mortar Superstar but this product is more potent. As with other retinol products, this is expensive at $82 for a 30ml bottle but I only need to use a few drops per application so it should last quite a while, plus I don't use it every night. This is a powerful product - it contains 3% retinoid in the form of Hydroxypinacolone Retinoate, caffeine which enhances penetration, bisabolol to soothe the skin and a super lipid complex to help lock in moisture. It is a lightweight oil that absorbs pretty quickly but because my skin is so dry, it needs a night cream applied over this (although I wait around 5 minutes to let it fully absorb). My sensitive skin didn't have any adverse reaction to this product and overall, my skin looks very clear with my pores looking less visible, which was why I bought this product. I notice that as I age, my pores look more visible but since I began using this, they seem to have shrunk and I also find that I am using less foundation - just one thin layer because my skin just looks better. Korres Castanea Arcadia Anti-wrinkle & Firming Range - Korres very kindly sent me some products from their new anti-aging range. I have been using the Castanea Arcadia Day Cream, Night Cream and Eye Cream so I am only missing the serum and although I don't have wrinkles yet, I do have fine lines and look for products that aim to firm and plump the skin. Castanea Arcadia is an ingredient which protects the collagen in the skin and combined with hyaluronic acid, they strengthen and nourish the skin. My skin has been loving these three products - the day cream is non-greasy but very moisturising, the night cream is rich in texture with a bit of slip to it, which I personally love in a night cream and my eye area looks much more plump since I started using the eye cream and thankfully, no milia have appeared. Overall, my skin is smooth, hydrated, comfortable and has more bounce to it. What I love about Korres is that they deliver high quality results at mid-range prices and they have a variety of ranges to treat all skin concerns. Dr Botanicals Advanced Anti-Oxidant Superfood Facial Oil - finally, I have a new facial oil,which was kindly sent to me, that I want to share my thoughts on. As you know, I love Dr Botanicals products - they are cruelty free and free of parabens and other harmful preservatives. This oil contains a combination of blackcurrant seed oil, wild plum and sea minerals all of which nourish, protect, heal and moisturise the skin in a non-greasy way. It has a light, fruity scent and it absorbs quickly. I have been adding a drop of this to my moisturiser on days and nights when my skin feels like it needs an extra injection on moisture. It is normally priced at £67.50 but for the month of April, you can buy it at the reduced price of £19.99 by using the code BEAUTYLYBLOG at the checkout. Have you made any changes to your skincare routine recently? Have you tried any of these products? I would love to hear in the comments below! All products are bought by me, unless otherwise stated. The Korres & Dr Botanicals products were sent to me. Opinion is always my own.